Even in 21 st Century, our world still sees national and regional disparity in medical care. Developing countries are experiencing a chronic shortage of doctors and medical equipment due to unstable public order and scarcity of financial resources. Our company, Lequio Power Technology Corporation, along with many global organizations like to overcome these obstacles in developing countries by providing for a reliable as well as affordable medical care. We work together with local people to develop a mechanism for the provision of medical assistance to every remote place with a view to improve the level of front-line medical care while keeping a lid on costs. The more we know about the needs of the front-line providers, the more our sense of responsibility is heightened. Our motto is to offer products made in Japan, which are truly trusted throughout the world, to all people in need. Today, just like every day, we spread our wings around the world from Okinawa. The 21 st Century has now started to produce significant transformation of the social structure not only in Japan but throughout the world. I believe that it is now the time for a profound review of the existing sense of values, common practices and constraints. While we must understand the constraints posed by our geographical location in Okinawa, the southernmost region of Japan, we are not defined by our location. We maximize the advantages of our location, using the world as the canvas on which to draw our own picture. We are determined to present ourselves as an organization which contributes to the world by transmitting solutions required by the world in accordance with our sense of values as well as sense of mission. 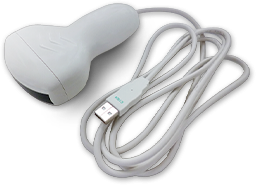 The ultrasound scanners are designed and marketed for developing countries and for educational purposes. We achieved the device with affordable price significantly below the average price of conventional ultrasound devices used in the medical field where health care services are provided under the Japan health insurance and in the medical facilities in Europe and the US. 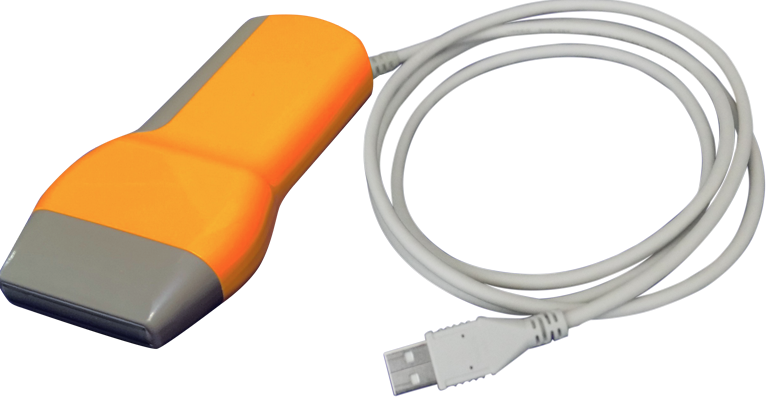 The devices are portable with the weight of only 170 - 270g and are powered by PC via USB connection, which supports usage at most medical sites during power outside and/or in areas where you cannot get the stable power. The unique function called SyncView makes it easier to visually understand which parts and angles you have been scanning. Both scanned ultrasound images of the subject and scene where you position the probe are recorded together by this function. 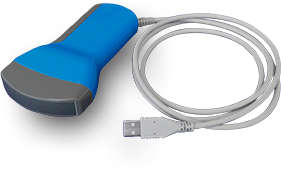 This allows you to confirm scanning parts and the angle of the probe easier and more in detail than body mark function conventionally used. Since it is simple and easy to review the scanning scene just by referring recorded video, this can be utilized as E-material, and will be useful for reviews, exchanging opinions, and getting advice. With our superior technologies for acoustic sensing, image processing and power management, this device provides you with the best resolution possible just under power supplied via USB connection. This device is developed for the purpose of reducing high fatality rates during labor/newborns in Africa. It is excellent in low power consumption and excellent in portability due to its lightweight, only 170g. *The Approval for Marketing Medical Devices (hereinafter ‘Medical Device Certification’) based on Pharmaceutical and Medical Device Act in Japan is not awarded on this device. When using this device, please confirm whether the medical device certification is obtained in the country that it will be used in. This will provide ultrasound images with higher resolution. This product is subject to the medical device certification in different countries. *Please be notified that medical device certification has not been obtained for this software/probe except for some countries, so please confirm whether the medical device certification is obtained in the country that it will be used in. *This product has linear and convex type. *The medical device certification is not yet obtained in Japan (as of Jul. 2018). 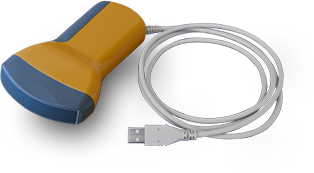 This device is marketed as non-medical grade one, which provides high resolution for educational purpose with lower price. *The medical device certification will not be obtained in any countries including Japan. This device cannot be used in any clinical field. *This product has linear and convex type. *Please refer the flyer of each product for its specification. Company Name Lequio Power Technology Corp.
November, 2011 Lequio Power Technology Corporation Founded. March, 2012 Capital increased to JPY 10,000,000. April, 2013 Capital increased to JPY 15,500,000. January, 2014 - Entered the generic medical equipment business for emerging markets. January, 2015 A project to expand the use of our ultrasound scanners in Sudan was adopted by JICA. October, 2015 Our headquarters have been relocated within the same township and expanded. August, 2017 Capital increased to JPY 77,195,000.